Jesus said Eat my flesh and drink my blood. Do you believe Jesus or do you murmur as the detractors of Jesus did? The Jews murmured about Him (Jn. 6:41). Who can accept it (Jn. 6:50)? Jews quarreled among themselves (Jn 6:52). How can this man give us [his] flesh (Jn 6:52)? Disciples murmuring about this (Jn. 6:61). 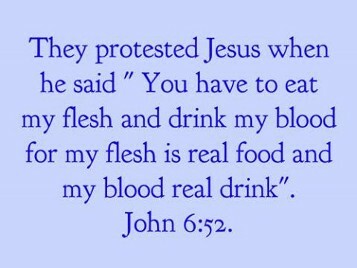 What Jesus calls true food and drink, others call symbolic! Two thousand years ago Jesus' very own disciples murmured against His words. They just couldn't believe that Jesus could give us His flesh to eat. There are people today who are still murmuring against the words of Jesus and in so doing they are following those who rejected His words. It was just too hard for some to believe. In the easy Gospel you can believe anything you wish; in the real Gospel you have to believe Jesus. Eddie de los Santos says: You were never told because it was never taught. Scripture clearly stated that the bread and wine represents the covenant of grace, established by Jesus on the cross. And that Jesus would come the same way He left us. Lenny Alt says: Eddie you are quoting from your tradition. The Bible does not say REPRESENTS it uses the word IS. Bible alone fails again because you are quoting from your tradition to the detriment of what's in the Bible. Kevin Osullivan says: Leonard, do you believe the bread turns into actual human flesh as Catholics believe it does? As an ex-Catholic who has received "Communion" hundreds of times, I can say with 100% certitude that it does not. It is purely symbolic. That is the basis of most non-Catholics arguments against transubstantiation. Lenny Alt says: Kevin, yes, I believe you have absolute certitude; however, your certitude comes from what you were taught in your tradition, and your tradition calls it symbolic. However, Jesus doesn't call it that, the Apostle Paul doesn't call it that, and the early Church Fathers, some of whom knew Apostles, didn't call it that. Should I follow your tradition or should I follow Jesus? What you call symbolic, Jesus calls true food and true drink (Jn. 6:52). You follow your tradition and I follow Jesus! Kevin and Eddie, I understand that you protest the words of Jesus, when He said eat my flesh and drink my blood. You guys are not the only ones who have protested the words of Jesus. Like you, many of Jesus' very own disciples left (John 6:66) because they could not accept what He was teaching. In fact, it is the only place in the whole of the Gospels where many of his very own disciples left. You think you are following Jesus, however, in reality you are following the people who murmured against Jesus and left because they couldn't accept His words. The skeptics today continue to echo the words of the detractors of Jesus and murmur the same objections because they don’t believe that Jesus can give us His flesh to eat. The Jews murmured about Him (Jn. 6:41). This saying is hard; who can accept it (Jn. 6:50)? The Jews quarreled among themselves (Jn. 6:52). How can this man give us [his] flesh to eat (Jn. 6:52)? His disciples were murmuring about this (Jn. 6:61). As a result of this, many (of) his disciples returned to their former way of life and no longer accompanied him (Jn. 6:66). There are many people today who continue to murmur against the words of Jesus and yet still claim to accompany Him. Either way, whether you choose to believe Jesus can give us his flesh to eat or believe that Jesus cannot give us his flesh to eat, you have a Biblical precedent. However, if you choose not to believe that Jesus gives us his flesh to eat you are not following Jesus, but following the detractors of Jesus who murmured against Him and left. As for me I choose to believe that Jesus can give us His flesh to eat. This way, I am following Jesus and am with the Apostles who stayed. Jesus could have said wait a minute, I didn't really mean true food and true drink (Jn.6:52), what I meant was merely a symbolic presence. But He didn't; He said to the twelve, "Do you also want to leave?" (Jn. 6:67). Simon Peter answered him, "Master, to whom shall we go? You have the words of eternal life. We have come to believe and are convinced that you are the Holy One of God" (Jn. 6:68-69). These same words of Jesus that some call symbolic, the Apostle Peter claims are the words of eternal life. Every time I post the Flesh and Blood words of Jesus in John 6:25-71, I get a lot of murmuring. Jesus has a message for those yesterday and today, who are murmuring against His words. He "said to them, 'Stop murmuring among yourselves. No one can come to me unless the Father who sent me draw him, and I will raise him on the last day'" (Jn. 6:43-44). "Since Jesus knew that his disciples were murmuring about this, he said to them, 'Does this shock you'" (Jn. 6:61)? Evidently it did shock them; that is why some people of His day and today continue to disbelieve Jesus. Jesus said to them, "Amen, amen, I say to you, unless you eat the flesh of the Son of Man and drink his blood, you do not have life within you. Whoever eats my flesh and drinks my blood has eternal life, and I will raise him on the last day. For my flesh is true food, and my blood is true drink. Whoever eats my flesh and drinks my blood remains in me and I in him (Jn. 6:53-56). A symbol of Jesus cannot save you; however, a real Jesus, who gives us His Flesh and Blood as true food and drink, can. Yes, I know, the words of Jesus are just too hard for some to accept and so they don't. In the easy Gospel you can believe anything you wish; in the real Gospel you have to believe Jesus.